Monday May 10th, 2010. Thomas Nathan Guillen Jr was born at 24 weeks and 5 days. I went into preterm labor and delivered Baby Tommy via C-Section. It was so scary and so shocking that if you saw a movie about the day you would think it was incredibly unrealistic. But Tom Sr was there by my side the whole time, assuring me that soon we would have our beautiful son and we’d make it. Baby Tommy weighed 1 pound 14 ounces and was 13 inches long. A big boy for less than 25 weeks! Tom Sr sneaked out to get a peek at him and came back to report: “He’s very cute, he looks like me”. When the surgery was over and they brought me to recovery we were elated. My baby was born alive! Tom and I cried with joy and relief. Both our families were there- shaken up but proud grandparents, aunts and uncles. After a couple hours we were taken to the Neonatal Intensive Care Unit. Thomas Nathan Junior was perfect. He had big hands and feet, and Tom’s exact ears. He could tell we were there despite the heavy sedative, tubes and wires. We fell so deeply in love with our son it felt like we each grew an extra heart. The next couple of days were a routine of pain medication, prayers, visits to the NICU and bouts of despair. It was hard for me to care about my own recovery. Friends and family texted and emailed their support. Everyone was rooting for little Tommy. But then the bad news started rolling in. Our sweet baby was just too young. He was a fighter, but he couldn’t fight hard enough. His lungs were diseased and his brain started to bleed. By Thursday we knew that Tommy’s chances were not good. Head ultrasounds revealed the worst case scenario. Tom Sr. and I tried to intellectualize what was happening. But as we started to tell our family that little Tommy wasn’t going to make it, we realized our new hearts couldn’t understand. Tom Sr and I cherished every moment we were with Tommy. We were so proud of our son- he was a perfect, beautiful fighter. He made us ecstatic with joy when we were with him. Every time we went up to the NICU to be with Tommy Jr we couldn’t stop smiling We were relaxed and laughing and tripping over each other to tell him stories about each other and our family and what it was like to be pregnant with him. We told him we couldn’t get over what an impatient little baby he was- again taking after his Daddy who was early everywhere he went. We thanked Tommy Jr for waiting- his Unkie Kev and Auntie Crissy were on their way home from New York City, and they really wanted to meet him. He had met the rest of his family and loved being held in his little incubator house. His family’s caresses made him so calm – a brief respite from the constant medical invasion. We spent Friday introducing him to our loved ones- we were proud of our friends and family. Everyone was able to access the same joy of being near and touching such a special little baby. When they laid my son on my chest I felt an explosion of love and happiness. It was one of the best moments of my life. I could stroke his back and kiss his little head. He squirmed up higher on me, like he wanted to snuggle as hard as he could. We lay there for an hour, then put him on Tom Sr’s chest. Seeing Tom Sr with his perfect son against his chest was the most beautiful thing I have ever seen. Tom took deep breaths of his son’s sweet smell, and laughed when Tommy Jr kicked his little feet against his chest. We were both infected by the calm and joy of holding our son. Saturday morning Kevin and Crissy arrived. They were so happy to meet their nephew and we told Tommy Jr that Kevin was going to teach him how to be properly naughty. They both cradled him in his incubator and fell in love. We were so grateful to sweet Tommy for waiting to meet his whole family. It wasn’t easy for him and it made us more able to understand if he had to go. Little Tommy Jr came early to say hello and give us the best week of our lives. His sweet spirit touch everyone who knew him, and his fight inspired us all. But in the end we knew he couldn’t stay. He had to leave us, maybe to be reborn as another person’s baby to spread his infectious joy. Then grow up and be a baseball player or a rockstar. Saturday May 15th, 2010 the complication of his brain bleed became insurmountable. My oldest brother (another Tom!) helped us wade through the medical jargon and understand what was really happening. The doctors told us we didn’t have much time with Tommy. 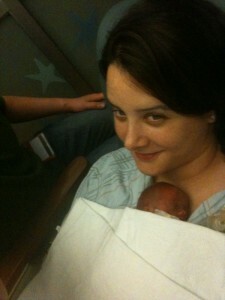 So at 5:30 we gathered in the NICU family room and Tom and I held Tommy on our chests again. I called over each family member and introduced them again to Tommy, and told him how special they were. Then everyone kissed him and said goodbye. We asked our family to leave and wait for us in our apartment. We wanted to say goodbye alone, as a new little family. When the doctors and nurses finally removed all the IV’s and tubes and cords, Tommy looked relieved. We got to hold him in our arms just like a healthy little baby. We got to kiss his face and toes and hands. He was finally free, he was finally a little boy. He stayed with us for almost two hours, we finally even got to hear him coo. Tom and I never cried. We were so happy for our son. We wanted him to be free of pain and just be with his family. It was a wonderful day- May 10th he was born, May 15th he was reborn. What a wonderful tribute to a fantastic little man. Thank you so much for sharing him with us. Please let me know if their is anything you need. I’m sure Tom Jr. enjoyed his short time with you as much as you did. And don’t forget that for a few short moments he was on stage and a star. Your family is so beautiful. I am so grateful to you for sharing your Strength and Love. No lifetime is ever long enough, but to make it as full as you have is an inspiration to us, and I hope we will share more eventually. I am a friend of cousins of Tommys parents. I am so sorry or your loss, you were both very brave to write such a beautiful letter about your son. He will always be in your hearts and he was a very corageous little guy to fight so hard. Hes in gods hands now and is a boucing strong baby in heaven. Words cannot express how parents go through a loss of a very special baby but you are all in my prayers. I am so very sorry. My thoughts and prayers are with you and little Tom. Truly a beautiful tribute. – And you two are a testament to courage; turning heartache into grace, love and joy. strong hand over your little son. Your love with be with him forever. My thoughts, love and praise for your stength is with you. What a beautiful tribute to your son. Thoughts and prayers to you all! Little TJ is truly blessed to have such loving and caring parents, who are truly living in the Moment, and we are truly blessed to be able to witnesses an example of Pure Love. This is a beautiful tribute to your son and to your love & strength. My heart aches for you and your family! May you continue to be blessed by the special moments you had with Tommy! May God heal your hearts and bring you peace. I haven’t written anything yet because it’s hard to know what to say. You’ve all been going through so much, and my heart is with you. I appreciate you sharing the story of your son–what a big impact for such a little guy! Life really does its own thing, regardless of what we want sometimes. But I know you will persevere, you lovely lady you. xo! beyond beautiful photo of you & baby tommy. thinking of you every minute. Thank you so much for sharing your family’s story- it is a beautiful one. You and Tom have amazing strength and love for each other. In the come days, weeks, and months ahead let that be your comfort and refuge. What a little fighter! He is watching over you sending you lots of hugs and kisses everyday. Thank you all for reading our story. Tom Sr and I are so lucky to have such wonderful support and an outpouring of love. It’s all we have now. Please know that our family is praying for yours. Please know that you will be in our prayers. One of the prayers that we hold deep for you is that your hearts will heal. Your great family and friends will hold your hands during this very difficult time. So moved by your strength and love. Tommy Jr. is truly an angel that will always be with you. May peace fill you, love surround you and the joy of knowing him warm your hearts forever. Tommy Jr. was in my thoughts all day on the 15th. He was a special little boy who grabbed a piece of my heart the minute I met him. He couldn’t have asked for two more wonderful parents. The love between the three of you was overwhelming. It was an honor to have cared for him. You both are so strong and full of love and we’re sure that your son felt it too. Our thoughts are with you. I had been rooting for Thomas since I heard you gave birth. I was so beyond impressed by your grace and strength through all of this. You are a mother. I am sorry for your loss, but so happy you got to meet the little guy. Its funny, I was once so affected by death and Gay really helped me through it. She helped me realize that people are put on this planet for a reason and I hope you and your husband are able to grasp some peace from the time you did get to spend with him.He will always be with you. Your story has left a permanent mark on all of us… we feel your strength in love and sadness at the same time— and that is the presence of God’s grace in action. We pray for your grieving days ahead, that God will lift you to the peaceful place where your Little Angel is flying happily…God bless you both…. always. Heather, you have a beautiful way with words…your essay was so heartfelt that I felt I was right there with you. I know God is watching over your little angel, as well as all of you. You have such faith, that God will bring you through all this. I love you with all of my heart and here for anything and everything. Thomas Nathan Guillen Jr will always be a true testiment to your loving kindness and inspiration of strength. Thank you for sharing your story. I never met you or your baby boy but I feel that he was filled with your love and courage. Please know that families like yours give others strength. Thank you for sharing your strong spirit. May you be at peace. What a wonderful tribute to a wonderful life. I will be thinking of the three of you today. I was deeply touched by your story to say the least, as well as inspired by the strength and optimism that is apparent in the both of you through this event. The Guillens have always been in my thoughts because you are a special family and I’ve always wished you guys well. I can truly say that Jr. will always be in my thoughts. Bless you guys.. I’m just one of the many hearts he’s touched…amazing! How lucky young Tommy was to have such a loving couple for his parents! We wish there could have been a better outcome for all of you. Your devotion to your son is so palpable in this sweet letter. Thank you for sharing the baby’s story with us all. May the heavens treat you kindly in coming years. Tom, Heather and Family, My heart was touched through your beautiful spoken essay. Your son sounds like he was definately a fighter and loved to meet his family. Your son experienced the best gift ever and that was the time and love you, Tom and the family gave him. My thoughts & prayers are with you all! Your story was wondefully told and is a true example of a parents’ love for a child and a child’s love for his parents. While only a loving experience for 5 days, it is a life long lesson to us all of being thankful for each day we have with our loved ones. May God Bless you and thank you so much for sharing this. Our deepest sympathy at your loss! Heather, I met you for the first time at the walk for pancreatic cancer. We lived next door to the Guillen family when Tom was growing up. Your words were beautiful! You will always have little Tommy in your hearts – and reading your words I know you will be wonderful parents to your future children. You are in our thoughts and prayers. I am a friend of Claudia Bohanek’s and had the great tearful pleasure of reading your story. Your strength and love and appreciation for life is so inspiring. I am so glad you got to meet and spend precious time with Tommy jr. He is a very lucky boy to have had that time with you and your special family. While it will take time, keep that spirit going that you have. You are absolutely right about being born and reborn. You gave him great comfort. God bless you both and your families. We extend our deepest condolences to you, Heather and Tom. Thank you for so eloquently writing about your experiences with your son. It really puts things in perspective as to how precious every moment of our lives is. We will continue to include you and your family in our prayers. You all will be in my prayers. This is such a wonderful way to remember him. I have no idea who you are. have no idea how I stumbled upon this blog. I too, had a son born around the same time. Also a big boy for 25 weeks. The mixture of love and sadness as you watch your child die is unbearable. I admire your strength and joy and am so happy for you that you have the outlet of writing to memorialize your son. Thank you Stacy. I’m so sorry you can relate. I hope that your hearts heals but your memories stay strong.